Many would know that travelling abroad for availing medical treatment by itself represents a cost-effective proposition. However, few would know how to minimise the ancillary costs to supplement the overall value offered by overseas medical travel. It also happens that though one budgets for all the primary costs relating to healthcare travel, one might not be fully aware of the secondary costs like those associated with conveyance, lodging, food, etc., and ways to minimise expenses related to these. 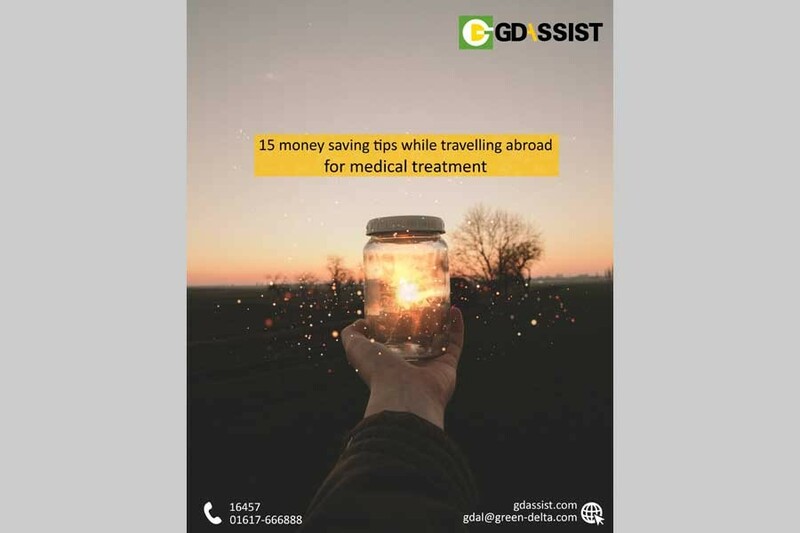 So here’s a list of 15 useful tips to save secondary costs while travelling abroad for healthcare purposes and come back in great shape – both physically and financially! Before you leave, it’ll be a good idea to research a bit on the city you’ll be travelling to find out more about the cost of living. If you have friends or family members who have travelled to this destination, you can also get information from them. You should plan and budget for your daily expenses for food and transportation and add 15-20 per cent for the unexpected. This is one of the most important points for you to consider. In most countries abroad, you can have recourse to public healthcare in case of an unforeseen medical emergency only at exorbitant costs. Hence, it’s a good idea to consider travel insurance that will cover you for the duration of your journey. It’s always better to get your currency exchanged in your home base. Not only will you be able to get a better rate, hence saving on currency conversion charges, you’ll also save time when you land at your destination. This would be all the more relevant for patients travelling on emergencies. Airlines the world over have become more stringent with levying extra baggage weight charges. With a view to avoid paying such levies, which can be pretty steep at times, you should travel light, packing only the necessary items required for the journey. Else, if you have to travel with extra luggage, you can look to pay for this additional baggage online as airlines typically offer discounts if this charge is paid on their portal. Although your medical tourism service provider will take care of this, it would be best to ensure that your layover time at the airport is the minimum possible, which will help you save on accommodation/food costs, while also ensuring minimum patient discomfort during transit. While in the host country, it’s important to be aware of service fees whenever you need to get money on emergency or otherwise. Generally speaking, ATMs will provide lower fees than currency exchange booths. Also, check for banks that are a part of the Global ATM Alliance, which would allow you to use partner ATMs at a lower fee. Although we made the above point, it must be emphasised that one should make ATM withdrawals as infrequently as possible because of the attendant service charges. Hence, it is best to carry cash or travellers’ cheque. Making international (ISD) calls will be prohibitively expensive from your home number and a needless expense, especially when one considers the predominant option of buying a local pre-paid SIM card. These cards have a variety of calling packs and you can choose the one that is the most-suited for your needs. Though rare, if the hospital requires you to purchase some medicines and other such consumables from outside for your patient, you can look for a reputed chemist in the neighbourhood and check for a discount, which they usually offer in the range of 10-15 per cent on the total bill. Else, you could also visit a medical wholesaler, especially for the purchase of costly medicines. Unfortunately, despite rapid technology advancements, prepaid calling cards have not grown more affordable in many countries. Hence, you can consider using a voice-over-IP programme like Skype to stay in touch with your family members at home. In many countries, restaurants are expensive. Hence, it would be an interesting idea to explore alternative food options like street food (doing this you’ll be able to sample local savouries) or opt for food trucks that have now emerged as a cost-effective idea to have innovative cuisine. In most countries around the world, restaurants offer relatively inexpensive buffet options with a wide variety of cuisine on offer. You can check the local listings in newspapers for such restaurants – and make the most of it. If you’re travelling as an attendant along with the patient, you can either check into a guesthouse around the vicinity of the hospital or even go for a service apartment which will have a kitchen, etc., in which you can cook your meal. Else, you can also check co-habitation sites that offer good accommodation options at reasonable prices. You could check for a lodging option in an around the hospital in which your patient has been admitted. Doing so, you’ll not only be able to walk to the hospital but also be available within short notice in case of any emergency. You’ll be able to save on commuting costs too. However, if you have to commute long distances, you can check shared rides (as offered by several multinational ride-hailing apps) or go for public transportation, like the metro. If you have decided to stay back for a few days after the release of your patient from the hospital, you should pre-book the accommodation to save on last-minute costs. Doing so will also ensure that you get the time to check a variety of hotels as per the patient’s post-operative needs, rather than rushing for whatever is available. So go on, look smart with these useful money-saving tips. And yes, consult with GD Assist before you embark on your outstation medical visit. That’ll be a smart thing to do too! Balm for the stressed-out corporate employee Hello Chattogram!